(F1) Neon matures quicker than most other pumpkin varieties we have tested. Uniform, 7 to 8 lb. fruit are produced in abundance and have a vivid, fluorescent orange color. 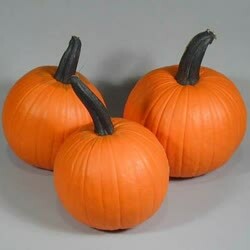 These small Jack O�Lanterns have medium ribs and thick black handles. The semi-bush habit of Neon allows for higher plant populations, resulting in higher yields per acre than full-size vine types.